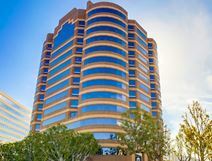 This wonderful and exquisitely furnished business center location is housed within an architecturally impressive and stunning glass façade building close to Ventura Freeway on a high-visibility site in a prominent location. The building is surrounded by various amenities and public services throughout the locality including local restaurants, popular retailers and a number of cafes. The area also offers excellent transport links and is easily accessible via both road and rail. Perfectly situated close to a number of hugely renowned and globally significant entertainment establishments including the likes of major names such as Fox, Warner Brothers, Walt Disney and Dreamwork Animation studios; this fully furnished Burbank office space is ideal for anyone working in the industry and is ideally surrounded by numerous dining options perfect for a quick lunch or taking clients out for dinner. Neighboring TV and movie giants in Burbank"s media district this coworking space is spread over four floors and located just off the I-134. The modern high-rise that the space occupies offers tenants beautiful views of the studios surrounding and beyond. Games room and state-of-the-art gym on-site. The regional transport links and local infrastructure are fantastic and make the center easily accessible. Close to all major freeways, this newly refurbished centre is offering onsite amenities and administrative facilities. This Burbank location offers many Media giants such as NBC Universal. This Burbank business centre located to shopping, the studios, and major freeways, this centre offers great views and comes with a range of services. This is a prime media area with the biggest names in the industry.